Alif's is extremely popular with local's and visitors alike. At all hours of the day, the place is completely full. Including at 4am when you are coming home from a night at local bars. It has a large outside area so you can eat on the street with scrawny cats walking around your ankles. It is certainly an experience and I rarely spent a day in Kuantan that I didn't eat a meal at Alif's. It is also extremely good value. A meal of curry and roti can cost less than US$0.50. Roti and fish head curry. Very tasty!! This is a Malay seafood restaurant where you can savour some of the popular local delights, like grilled fish (ikan bakar), Tom Yam Soup (spicy & sour soup). 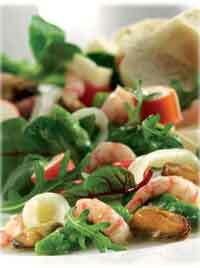 Seafood include prawns, fishes, squids, crabs, sea shells, etc. You can order the food to the cooking-style that you preferred. 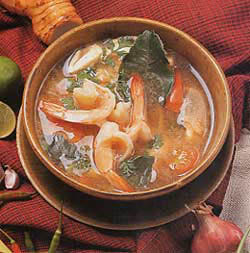 However, their signature dish must be the spicy Tom Yam soup. 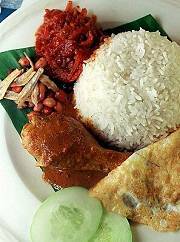 It is served in a large portion and generous in ingredients like fish, chicken meat, squids & prawns. The price is only RM5 per bowl. Be prepared to try this fiery soup. If you would like to taste the grilled fish wrapped in banana leaf, please proceed to the counter to select the type of fish that you like. The staff there will help you to weigh the fish and quote you the price. Ask for the various cooking method to suite your taste. Along right hand side of the road, you can see many Malay restaurants offering grilled fish or seafood. As a general rule, remember to ask for the price per 100g of fish / seafood & bargain before they are put on the grill. Directions: After crossing the bridge on river, the first restaurant on your right. This is one of the famous local seafood restaurant in Kuantan. It's famous for its signature dish of stuffed crab, grilled fish (ikan bakar) & etc. Directions: It is located facing the Beserah Beach. This coffee shop is newly opened in August 2004. 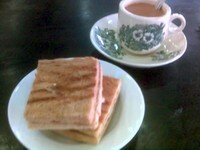 It is kopitiam-style and serves coffee, tea, nasi lemak (santan rice), toast, some snacks, etc. You can see some old deco in the coffee shop like the old Shanghai cover girl posters. Directions: At the shop houses near to Berjaya Megamall just right at the corner. This is a shop that was recommended by a VT member who lives in Kuantan. 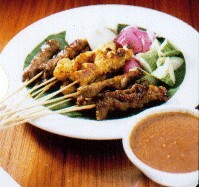 The restaurant is two-storey and offers a variety of meat for skewer. Eg: chicken, beef, lamb, rabbit, ostrich, etc. Articles taken from www.virtualtourist.com. Pictures shown above are just for illustration purpose only.